Sneezeguard Solutions ® sneeze guards are designed to be easily repaired should the food shield become cracked, scratched or damaged. The Acrylic replacement kit comes with all of the parts you need to restore your Sneezeguard Solutions® food shield to its original condition. 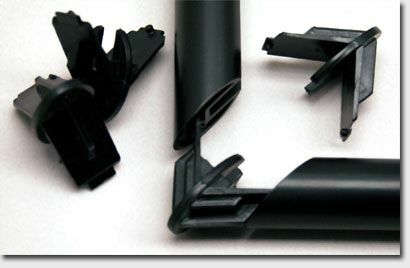 The Acrylic Replacement Kit comes with the new food shield, Gasketing and Corner Connectors. Download the step by step instructions here on how to remove and install the food shield. The Acrylic Replacement Kit is designed to fit all of Sneezeguard Solutions® sneeze guards. # 3400 Acrylic Replacement Kit - 2 ft.
# 3500 Acrylic Replacement Kit - 3 ft.
# 3600 Acrylic Replacement Kit - 4 ft.
# 3700 Acrylic Replacement Kit - 5 ft.
# 3800 Acrylic Replacement Kit - 6 ft.
# 3880 Acrylic Replacement Kit - 8 ft.